Definition at line 482 of file polyDBG.cc. Definition at line 697 of file polyDBG.cc. Definition at line 721 of file polyDBG.cc. Definition at line 679 of file polyDBG.cc. Definition at line 549 of file polyDBG.cc. Referenced by directedLine::cutIntersectionAllPoly(), and DBG_cutIntersectionAllPoly(). Definition at line 257 of file polyDBG.cc. Definition at line 138 of file polyDBG.cc. 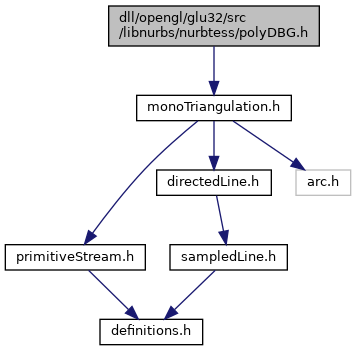 Referenced by DBG_cutIntersectionPoly(), DBG_edgeIntersectChainD(), DBG_edgeIntersectPoly(), and DBG_polygonSelfIntersect(). Definition at line 198 of file polyDBG.cc. Definition at line 412 of file polyDBG.cc. Definition at line 216 of file polyDBG.cc. Referenced by findDownCorners(), and findUpCorners(). Definition at line 98 of file polyDBG.cc. Referenced by sampleMonoPoly(), and triangulateConvexPoly(). Definition at line 73 of file polyDBG.cc. Definition at line 60 of file polyDBG.cc. Definition at line 302 of file polyDBG.cc. Definition at line 392 of file polyDBG.cc. Definition at line 284 of file polyDBG.cc. Definition at line 230 of file polyDBG.cc. Referenced by DBG_cutIntersectionPoly(), and DBG_polygonListIntersect(). Definition at line 270 of file polyDBG.cc. Definition at line 321 of file polyDBG.cc. Definition at line 435 of file polyDBG.cc.